Figure 3-33. Fleet mooring hardware components. Figure 3-35. 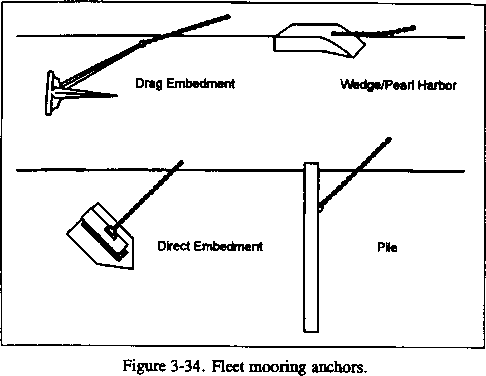 Drag embedment anchors. Figure 3-36. Fleet mooring ground leg options. • Direct Embedment Anchors. 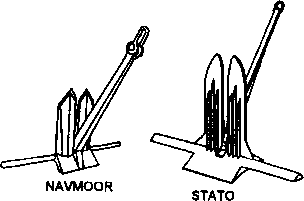 Two direct embedment anchor types, which are characterized by their method of installation, are used in Navy fleet moorings. 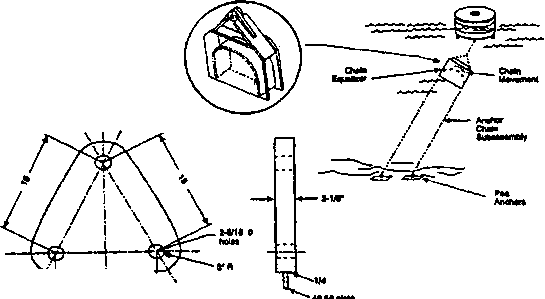 They are the propellant-embedded anchor (PEA) (Figure 3-37) and the pile-driven plate anchor (PDP) (Figure 3-38). 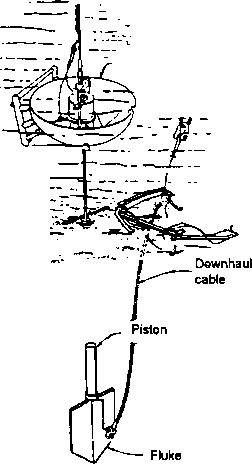 The PEA with a wire downhaul cable is fired into the seaf-loor from a gun (harpoon-like). The wire cable is particularly susceptible to wear at the soil, coral, or rock interface. The PDP is driven into the seafloor by a pile driver and follower assembly. A chain or chain and wire combination can be used with the PDP, but the chain segment always occurs at the soil or coral interface to reduce wear potential. The seafloor interface segment of wire or chain connected to all direct embedment anchors should be inspected. • Pile Anchors. This anchor is used often with bow ground legs of Mediterranean moorings. Its use should be limited in the future due to expanded use of driven plate anchors. The pile anchor to chain connection is usually located below the mudline. Inspection of this connection can be accomplished using a suction dredge to uncover the connection. Inspection is only necessary if there is indication of severe chain wear/corrosion at the mudline. Deterioration of fleet moorings is primarily due to corrosion and wear losses on the mooring chains, fittings, and anchors. Fleet moorings are affected by loss of buoyancy due to accumulations of fouling organisms. Fleet moorings are also affected by both electrochemical corrosion and a form of corrosion known as fretting. Fretting is the combined effect of corrosion and ordinary wear. Fretting and ordinary wear is caused by the relative movement between interconnecting links and fittings under the influence of waves, currents, tidal variations and action from the motion of the buoys. Corrosion and wear of metal components is observed as pitting, holes, cracks, fissures, loose or missing bolts or rivets, and reduction of chain wire diameter. Reduction of chain wire diameter is often greatest at interlink connections. 3.5.3.1 Chain-Link Measurements. One significant parameters used to evaluate the condition of a mooring is the chain wire diameter. A selective sampling of wire diameter of chain links and connecting hardware is taken to determine the amount of deterioration due to corrosion and wear. • "Single-link" measurements are taken where chain is slack. • "Double-link" measurements are taken where two links connect under tension. Figure 3-39 shows where chain-link measurements are made. Chain links and other chain components that measure greater than 90 percent of original wire diameter are considered to be in "good" condition. Measurement between 80 and 90 percent of original diameter is considered "fair" condition and is cause for the mooring to be downgraded in classification. Measurement less than 80 percent is considered an indication of "poor" condition and is cause for the mooring to be declared unsatisfactory for fleet use. Inspecting a fleet mooring should be performed after contacting the fleet mooring inspection agency (NFESC Code ESC55) and in accordance with the following checklist. The information should be recorded on a standard fleet mooring underwater inspection report, as illustrated in Figure 3-40. 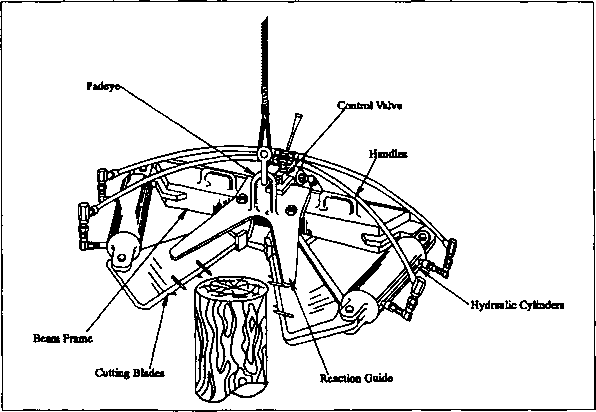 • Measure and record buoy diameter and freeboard (waterline to top of buoy). How to install screw anchors under water? Are propellent embedment anchors legal in 2013?